What Happens When Plaster Walls Get Wet? Plaster walls are uncommon in newly built homes, but if you live in an old house, some of your walls may be made of lath and plaster. 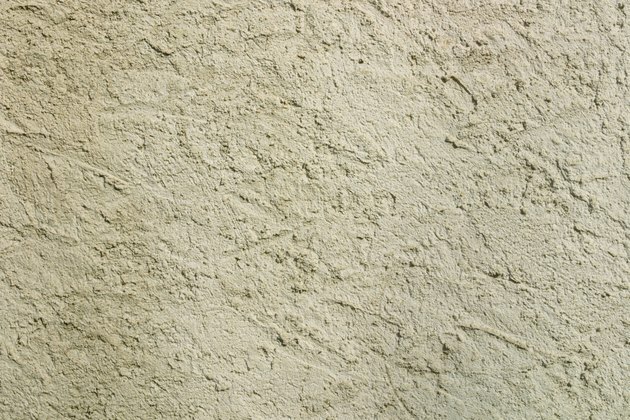 To make plaster walls, plaster is applied wet to a wooden lath wall structure and allowed to harden. As such, water is a plaster wall's enemy. The damage that water causes to plaster walls depends largely on the amount of water. A small amount of water will not damage plaster. A small amount of water, such as a splash or a wet article of clothing rubbing against the wall, is typically not detrimental to a plaster wall. If the water is minimal, wipe off the wall quickly and your wall will remain solid and intact. When you spill a small amount of water on a wall, use a dry cloth to absorb it and wipe the wall dry, and then aim a fan on the affected area to help speed the drying process. A significant amount of water on a plaster wall, especially if left untreated, can quickly soften and loosen the plaster. This type of damage is common after leaks, especially when the plaster is in the home's basement and rainwater runs down the inside of the wall. Over time, the dampness may begin to mold, negatively affecting the air quality in the home. The longer the water sits on the plaster, the more damage it will cause. While water can cause damage by softening the plaster itself, the problem may be even worse inside the walls. If the wall is saturated with water, the wooden lath behind the plaster will absorb water and begin to expand. As it expands, it pushes outward and can cause the wall to crack and weaken. When this is the case, you will typically have to replace the wall. Unless you want to put in a new plaster wall, the best option when faced with water-damaged plaster is to tear out the wall with pry bars and refinish the wall in modern drywall. When tearing out the wall, wear a dust mask and ventilate the room, if possible. Because plaster walls are uncommon in modern homes, the plaster may have been painted with lead paint, which can be a health risk unless you wear the proper protective equipment. What Could Cause the Plaster on a Wall to Become Powdery?